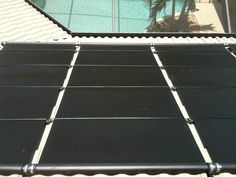 Let me start by saying that the solar energy debate has nothing to do with solar pool heating or solar water heating, which are traditionally the bread and butter of solar energy products in Florida. This debate is about solar electricity (photovoltaic panels). There has been a rash of articles recently describing a brewing battle between utility companies and the solar energy industry in Florida. Things reached a boiling point when the Public Service Commission refused to hear PUBLIC comment on issues that affect the solar industry. (read that again – it’s true – and it’s shocking). On one side we have the investor owned utility companies and an army of lobbyists with virtually unlimited budgets who have the ear of elected legislators, who appoint Public Service Commission members. On the other side you have a bunch of small companies and individuals who are somewhat organized but very poorly funded. It’s a classic David vs. Goliath battle. From their most recent email blast – FPL would make you think they want you to use less electricity – which is exactly what solar energy producers do! The utilities both individually and through industry groups have been making irrational, but persuasive arguments against solar electricity on several fronts, and the latest is the bizarre argument that solar energy production hurts low income energy users. This theory has been pitched to legislators and groups that tend to represent lower income groups, and they have bought it hook, line, and sinker. The basis of the argument is that solar energy producers (“rich people who can afford solar energy” in their minds) use the electricity grid, but don’t pay for its upkeep because they pay less to the utility company when they use less net energy. 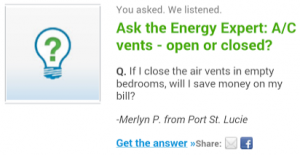 What makes that argument bizarre is that you would have to say the same thing about people who install Energy Star appliances, high-SEER Air Conditioners, variable speed pool pumps, LED light bulbs, and other energy saving improvements to their homes. Those people (the “rich” ones who can afford these upgrades), are shifting the burden to low income people the same way solar energy producers do – if you pay less for your electric bill, you are making your neighbors pay more proportionally to keep up the grid. News Flash: By turning off the lights you are hurting poor people!!! It sounds funny, but that’s exactly the argument they are making. Your utility company sends out emails and bill inserts that tell you how to lower your bill. They pay rebates for energy saving appliances. They want you to think that they really care about you using less energy. Maybe they should just send those tips to poor neighborhoods so rich people don’t accidentally save energy. Shame on them – the utility companies are hurting the poor by telling rich people how to save energy! In all seriousness, and it is a very serious issue for the solar industry and consumers alike, naturally you would expect people who use more energy to pay more of the upkeep costs for the infrastructure required to produce and deliver electricity. The truth of the matter is that distributed solar energy reduces the infrastructure needed. Less production capability is needed (smaller power plants), long-distance transmission lines are reduced, and another “fuel” is added to the mix to reduce risk (by the way, FPL has most of it’s eggs in the natural gas basket, a finite fuel with fluctuating prices). What’s really hard to determine is how much reduction in infrastructure is created when a solar energy system comes on line. What is certain is that the argument on the utility’s side is blown way out of proportion. What do utility companies want? 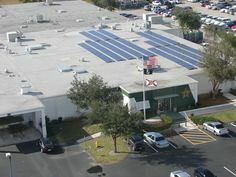 The want an end to Net Metering, the de facto interconnection method for solar energy systems in Florida and many states. Net metering means you only pay for the net amount of energy you consume each month after taking into account how much electricity your solar energy system produces. The key is that sometimes you are consuming more energy than you are producing, and sometimes you are producing more than you are consuming. Most net-metered customer still consume more than they produce on a monthly basis and still get a bill for the net amount of energy consumed. The sticking point is that at any given instant, a producer may be making more power than they are using, and the utility company is obligated to take that energy back and put it in the “bank” for the producer. In reality, this excess energy is being used elsewhere in the neighborhood. The utility companies argue that solar energy producers get the benefit of “selling” energy to their neighbors, but don’t pay their fair share for the grid upkeep. They don’t want to “buy” back energy from producers, or at least they want to “pay” less to do so. The utility isn’t really buying or paying for anything – another non-solar consumer is doing so at exactly the same rate they would if the electricity emanated from a natural gas fired turbine. The argument that lower income energy users have to pay more for solar energy is bunk. What is “fair” when it comes to energy production and distribution prices? Many would argue that there should be a higher base charge for all customers that compensates the utility for grid upkeep whether you use it or not. After all, being connected means you can use it if you want. Couple this with lower per unit rates, and some would be winners and some would be losers. While this would be “fair,” inevitably smaller consumers, presumably poorer people, would suffer. A 1,500 sq ft house and a 3,000 sq ft house may both have 200A utility service, which means the utility has the same costs to service each customer excluding the amount of electricity used (see my article on how homes don’t use energy – people use energy – here). Therefore, the larger home is already paying disproportionately higher prices to keep up the grid now. There are fixed and variable components to electricity production and delivery, and the current rate structure covers a large proportion of fixed and semi-fixed utility costs with rates applied to variable usage. 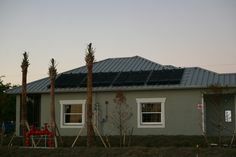 In reality, most solar homes in Florida don’t send much electricity back to the grid anyway. Energy use in homes follows energy production pretty closely, largely due to air conditioning use during the daytime when solar energy systems are producing. Pool homes have a base load that eats up a good chunk of the solar production during the day (unless you have an energy saving variable speed pump, which I highly recommend). This debate is has a philosophical component and a business component. Utility companies would make you think that we are out clubbing baby seals and taking food from babies. Think for a moment what the real motivation of investor owned utility companies is most likely to be. They want to maintain their monopoly and cut out other producers. Net metering works. Is it a threat to utility companies? Perhaps, in the long run. Does it steal Cheerios from the orphanage? Hardly.